RenewableUK is today announcing that the UK has hit a historic milestone of 20 gigawatts (20,000 megawatts) of wind generation capacity. The opening of Ørsted’s 659MW Walney Extension off the coast of Cumbria this month pushed the total amount over the 20GW mark. 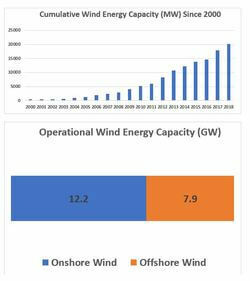 Total operational capacity of onshore and offshore wind in the UK currently stands at 20,128MW, which is enough to meet the annual power needs of more than 14 million homes, cutting carbon emissions by 25 million tonnes a year. Wind is the UK’s largest source of renewable electricity, accounting for half of the 30% of power that came from renewables in 2017. Commenting on today’s announcement, RenewableUK’s Executive Director Emma Pinchbeck said: “It took 19 years to install the first 5GW of wind energy in the UK and we’ve now installed the same amount in under two years. That phenomenal growth shows just how quickly the UK is moving to a smart, low carbon power system and wind energy is at the heart of that.